Young galaxies are often surrounded by a halo of hydrogen gas. Over time this gas can be pulled inward, where it can feed star production in the galaxy. 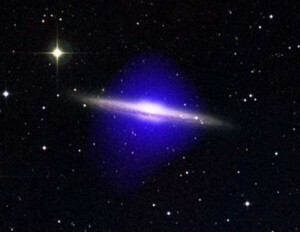 While we’ve known these halos existed, it has been difficult to determine their size. But new research from the Atacama Large Millimeter/submillimeter Array (ALMA) has found that some galactic halos are surprisingly large. These young galaxies are so distant that their light travels for 12 billion years to reach us. They are so distant that we can’t observe the halos directly. In fact, until this latest research we couldn’t even observe the galaxies because they are so faint. The hydrogen gas halos were detected by looking at the light of even more distant quasars. Quasars are intense sources of light, powered by the immense gravity of supermassive black holes. As the light travels to Earth, it passes through material such as these hydrogen halos. The hydrogen absorbs certain wavelengths of the light, giving it a unique spectral signature. While the quasar light clearly showed the presence of hydrogen, we couldn’t determine the size of the halo without knowing where the center of the galaxy was. It was generally thought that the galaxy would be seen fairly close to the quasar, since the galactic halo was probably rather small. 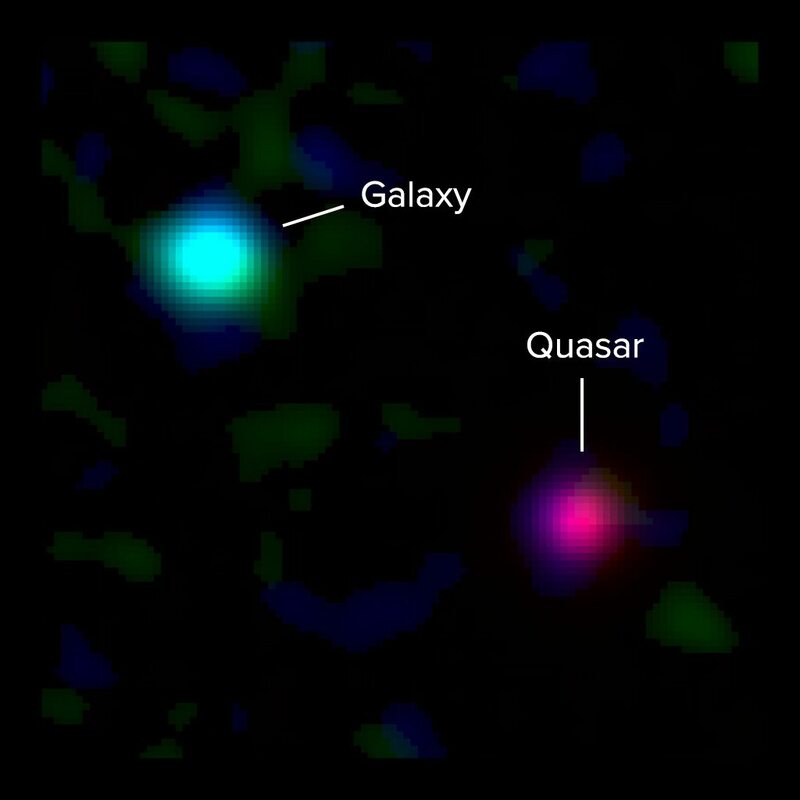 But ALMA showed the quasar wasn’t next to the galaxy, meaning the halo is quite large. 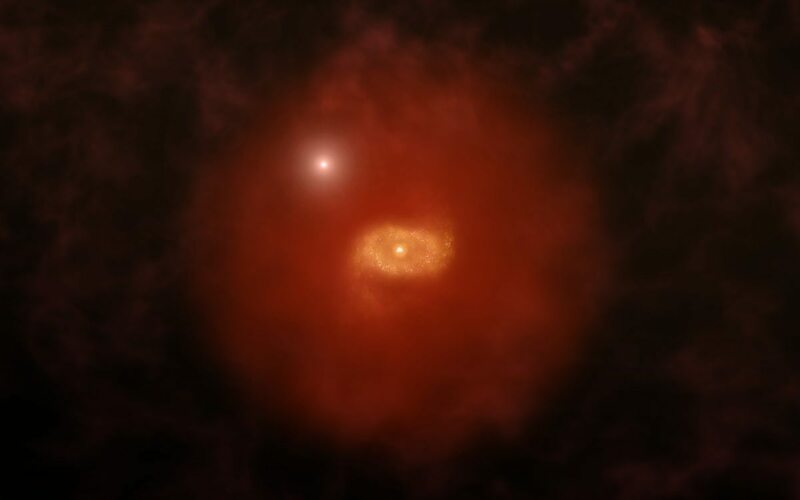 ALMA found the galaxy by observing the glow of light from ionized carbon. This kind of ionized carbon is found in the dusty star-forming regions of a galaxy. They observed two galaxies, widely separated from quasars. By observing this light the ALMA team also found the galaxies were rotating, and that they were producing stars at a moderately high rate. The rate of rotation indicates that these are young spiral galaxies, similar to our own Milky Way. The spacing of these galaxies from the quasar indicates that the halo extends at least 60,000 light years from one galaxy, and 137,000 light years from the other. Observation of these extended super-halos tells us that at least some young galaxies had large regions of surrounding material. This material would later fuel the growth of these galaxies as well as star production within the galaxy. Is that from some Chinese proverb? much proverb, so typo, amaze. Thanks, I’ve corrected it. Also, on a less nitpicky point, what was the reasoning behind assuming the halo would be small? They’d be small as they’re pulled into the galaxy, sure, but why would we assume they’d start that close?